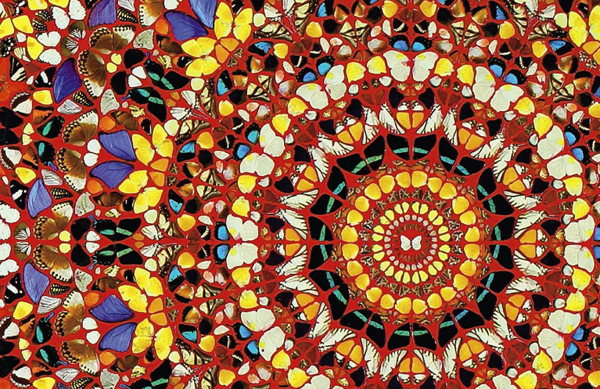 I find the witchhunt against Damien Hirst odd in its singling out of just one man. 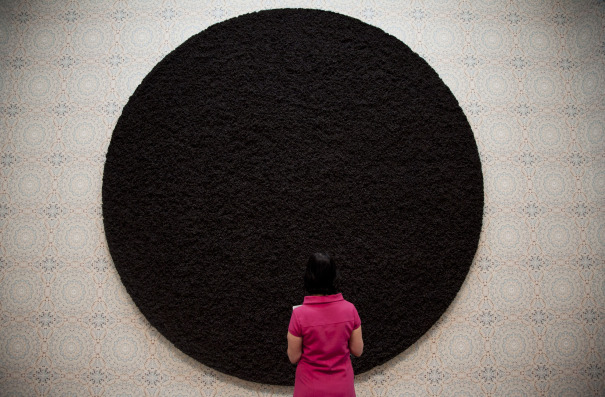 The nature of the art market is for as much money to change hands as possible, in order to invest for a higher sale in the future. It’s fat cat gambling, basically. Stock market politics. The industry is responsible for germinating the notion that the more grossly overpriced a work is, the more worthy it must be – a fallacy which fills my bones with anger and disgust. 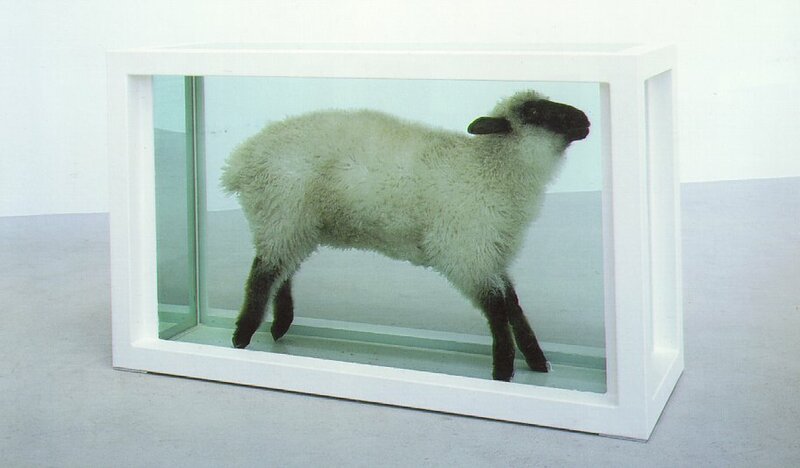 So if Hirst’s works are not Art and not worth anything, then surely it’s the market who’s the fool in this situation? I’m not sure how that is more Damien Hirst’s fault than any other artist. Maybe he played the system. Well, don’t shoot the messenger. Not half as many column inches have been written about arms dealers who make billions from selling weapons to violent dictatorships, yet somehow people see that as less of an affront than Hirst whipping off spot paintings ten to the dozen. Remarkably, people seem genuinely offended, as if our very nation has somehow been tarnished by this so-called ‘charlatan’. Making my way around the controversial Tate retrospective, I found the legendary Spot Paintings difficult to deal with. 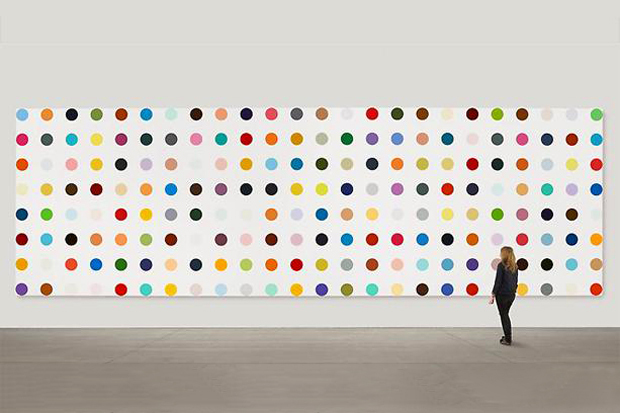 Having grown up in the 90s, the spots are, to me, synonymous with modern British art and to look at them objectively and try to provoke a response was surprisingly onerous. Too much has been said and written about them already. My head was full of Saatchi and Sewell and Guardian Arts. I don’t dislike the paintings, although I found them rather tiresome after the third or fourth piece, a feeling which also covers my response to his Medicine Cabinets ’89. To decipher the message he was trying to portray through the choice of medicines in each cabinet and on each spot-covered canvas seemed just too much like hard work. So how about the much-discussed fact that a lot of these pictures are produced by assistants in his studio? Well, so what? 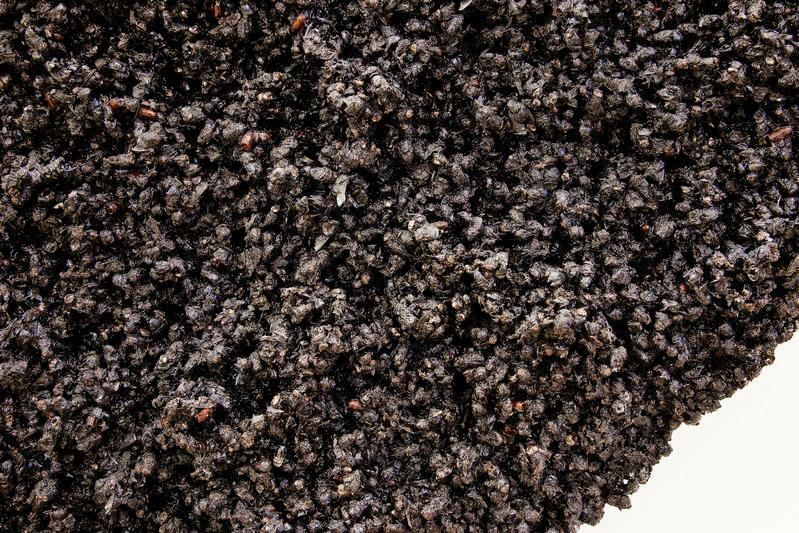 Leonardo did it, Michelangelo did it, blah blah blah. What is wrong about it is that the other artists in the team are not credited for their contributing work. Maybe the lead artist should take the main credit, for the concept and design, then the team receive listed credits and a share of the royalties. 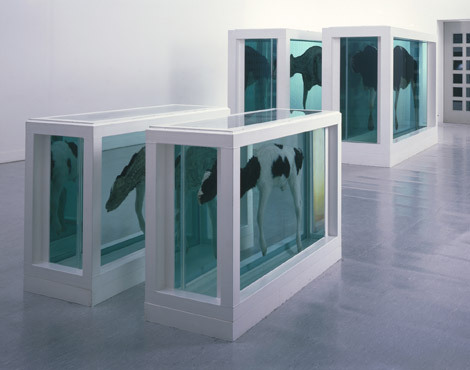 As everyone must now know (unless you’ve been living in a cave for the past 20 years) Hirst’s work is strongly themed around the life cycle; birth, death and mortality. 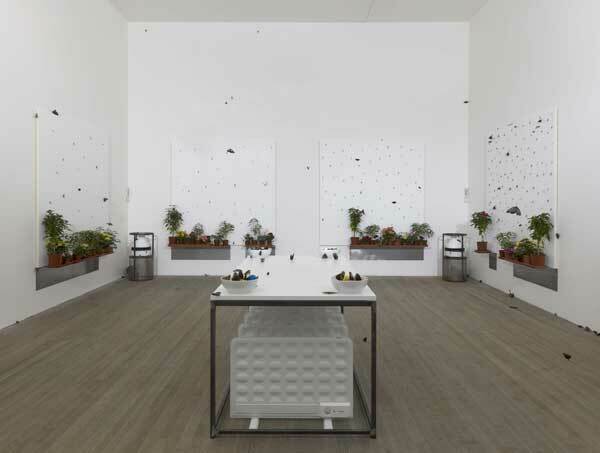 Earlier works, such as Away from the Flock ’94, evoke the spirit of a young Hirst searching for meaning and using his own place in the cosmos to ask those very same questions he had seen tackled in countless works of art throughout history. 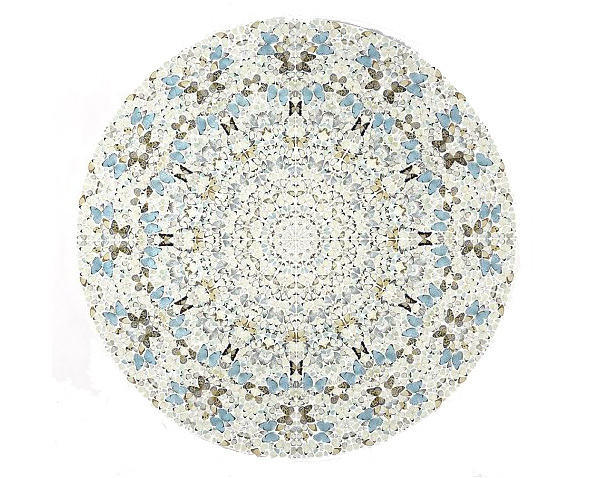 Vanitas symbolism is explicit in Hirst’s works; skulls, butterflies, decay, but depicted in a unique way. Had Hirst followed tradition and produced gloomy oil paintings containing these connotations of mortality (see Pieter Claesz) his work would not have broken boundaries and become so representative of modern British art. In A Thousand Years ’90, a symbolic sculptural piece expressing the nature of the life cycle, Hirst manages to create a poignant visual language which references the Vanitas movement whilst placing his work within the modernist, technological zeitgeist. His later pieces, in comparison, seem to radiate a dark, bitter and violent hysteria; they play out the cliched tale of optimistic, inquisitive youth morphing into the vitriolic older man resigned to his fate.The pieces seem to spit death at the viewer like venom. In contrast to the curious anatomical element of Mother and Child Divided ’93, for example (at which I heard someone whisper ironically ‘eww that’s disgusting…ooh is that bit a rump steak?’), his more recent pieces I Am Become Death, Shatterer of Worlds ’06 and Black Sun ’04 (hundreds of thousands of dead flies glued to resin on a perfect circle) portray a deeply disturbing and gruesome cynicism. The latter in particular seems to just revel in repugnant mass destruction and provoked images in my mind of blood spattered murderers grinning at their spoils. Both Sympathy in White Major – Absolution II ’06, and Doorways to the Kingdom of Heaven ’07, are aesthetically beautiful whilst hopelessly morbid. 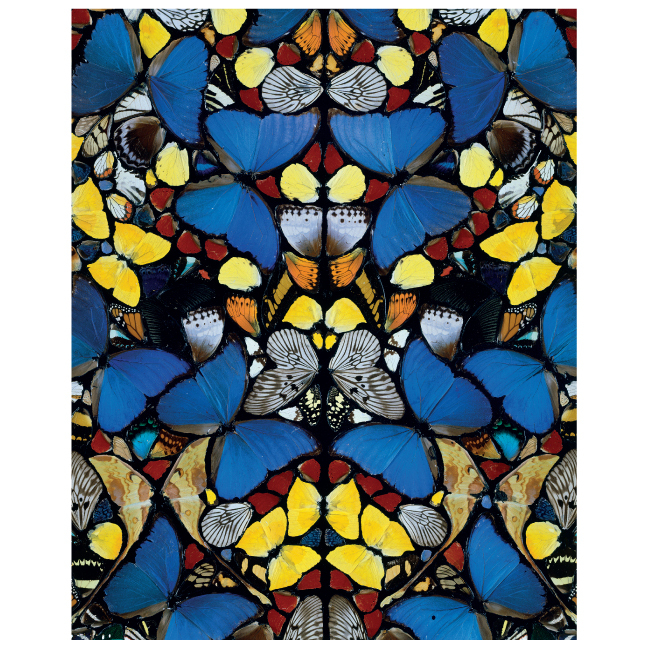 Hirst disassembles the pure artistry of nature, in the form of millions of butterflies, and reconstructs them to fit the human idea of beauty; that of order and tessellation ie. stained glass windows. He appears to be mocking the chaos and non-conformity of nature by forcing it to yield to his power; that of his life over their death. This theme continues in the installation In and Out of Love ’91, possibly the most controversial work of the whole show. I, like many others, found the work distasteful. These creatures are not already dead like his other specimens, but living and trapped inside a white-walled room. It was extremely sad to watch them fluttering at the walls and floors trying to get out. 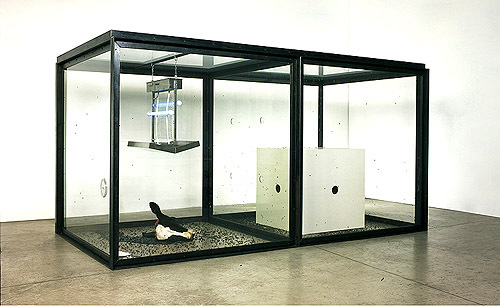 But perhaps this is one of Hirst’s points about mortality and the human response. It’s interesting that we can be so horrified by the carcass of an animal we are happy to eat every Sunday with our roasties, and that we don’t mind sticking a thousand chickens in less space than the dimensions of their body from the start of their short lives until they are on our plate, but we shy away from butterflies having a restricted lifespan. Maybe because they’re pretty? We have been de-sensitised to cows and chickens over the years, but butterfly beauty wins the awards in the commercialism stakes. Our response to death is so varied depending on how it is presented to us, it smacks of hypocrisy. 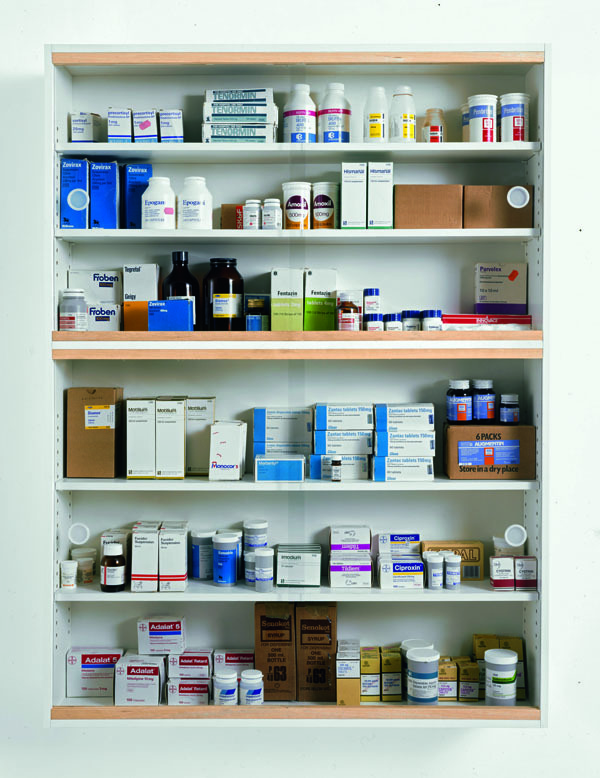 With his later works becoming increasingly acrimonious, in an ironic way Hirst is himself becoming a symbol of the decay which so fascinates him. Alas, he cannot join his cows and sheep in suspended animation…although, well, you never know.